Kenney Bui, once a promising student and high-school football player, died in October 2015. During a game less than a month earlier, the 17-year-old defensive end experienced what was diagnosed as a mild concussion. After passing a standardised concussion protocol used by thousands of schools and colleges across America, Kenney was cleared to return. Tragically, the next time he stepped onto the field would be the last. After leaving the game following a collision, he lost consciousness and died in hospital three days later. This heart-breaking story was recently revisited by The Wall Street Journal in light of a comprehensive new study that suggests student athletes are being sent back onto the field before they have fully recovered from these car crash-like impacts. The study of 28,000 college athletes by the CARE Consortium suggests current means of assessing concussions and the subsequent recovery from them is flawed. "There is a period of vulnerability after the athlete's cognition is recovered but before the brain is recovered," Michael McCrae, the neurosurgery professor behind the study, told the Journal. Alongside that research, there's a growing movement of start-ups and medical researchers looking to wearable tech to help with the concussion epidemic. 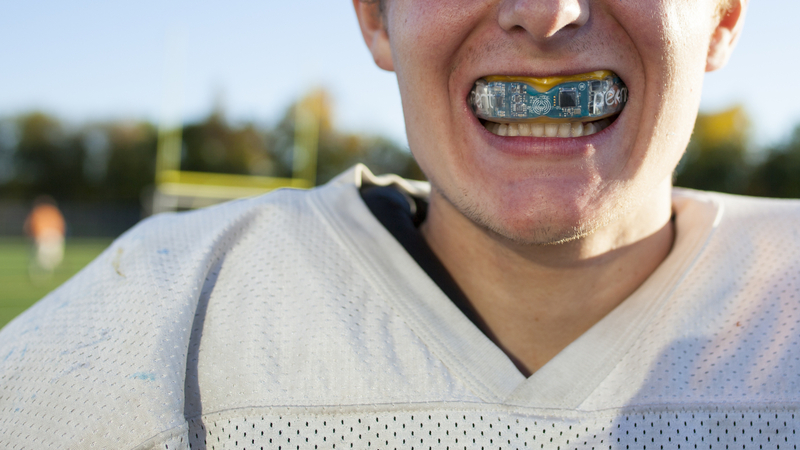 One of them is Prevent Biometrics, which uses a clinically tested Head Impact Monitor in the form of a Bluetooth-enabled mouth guard. It harnesses an array of motion sensors that detect linear and rotational force as well as the location and direction of each "impact event" within accuracy of +/- 5%. Potentially, it's game changer. When the $199 device registers a hit above a threshold known to cause concussions, a real-time alert is sent to an iOS app. If out of range, red LED lights will also flag it. That's the signal an athlete should be pulled for a concussion assessment. The company is hoping to eradicate the 50%+ of 3.8 million sports concussions that go undetected and untreated in the US every year. "At the core of our beliefs, whether it's at high school, college or pro level, the problem is the current subjective observational system." CEO Steve Washburn tells Wareable. "As a result of that concussions go undetected." "We need to make sure they're diagnosed and treated and recover fully before athletes go back on the field of play." It's the cumulative effect of those untreated concussions that have been linked to longer-term degenerative diseases like chronic traumatic encephalopathy (CTE), which formed a significant part of the NFL's recent $1 billion legal settlement with former players. Although Prevent's wirelessly-charged solution will undergo NFL lab testing later this year ahead of an on-sale date in late 2017/early 2018, the Minneapolis-based company is primarily focused on the youth game, which often lacks the medical resources and expertise available in the pros. "Concussion identification often relies upon the coach." Washburn, who ran the Shock Doctor mouth guard firm previously, says. "If you're a coach and you're watching the game, it's hard to see everything," the firm's CMO David Seigel chimes in. "There are a lot of hits all the time and it's hard to know which ones are problematic." So why a mouth guard rather than a new helmet, you ask? Well, this intelligent mouth guard was initially developed by neurosurgeon Dr. Vincent Miele at the Cleveland Clinic, who moonlighted as a ringside boxing physician. He was looking for a better way to determine whether fights should be called, before brain injuries occurred. Because the upper arches of the teeth offer a secure coupling to the skull, which is the only way to achieve accurate head impact measurements, Dr. Miele decided this was the best way forward. Provided you can stop players chewing it, the Head Impact Monitor has been designed to maintain that coupling. It also has a flexible circuit board protected by an injection molding process that'll offset concerns about putting a computer in your mouth. We'll never know whether immediately identifying the severity of the hit(s) would have altered the fortunes of Kenney Bui; after all he was diagnosed and cleared the standard concussion protocol, and returned to play… fatally. Perhaps a greater understanding would have protected him and others from the deadly "second-impact syndrome," which occurs when a second concussion occurs before full recovery from the first. Prevent Biometrics hopes their data driven approach, which records every single hit while eliminating false positives, could improve understanding of concussions and lead to farther-reaching changes across sports. Washburn says: "This is the first time anyone has had reliable, accurate head impact data of any kind to talk about. Whether there are more impacts, fewer impacts, bigger ones, different ones, no one's ever really known. "We can now provide concussion researchers with accurate data for the first time. The whole concussion science will get better because of the product." Prevent believes that the data could lead to improved equipment, different playing techniques like altering the way players tackle, or even rule changes within the sports themselves which could have the knock-on effect of preventing the concussions rather than just detecting them. On the other side of the Atlantic another wearable-based effort is underway that could assist with the diagnosis and recovery from concussions. It uses a virtual reality rig and a piece of classic tech currently gathering dust in millions of homes. How many times have you watched a Premier League football game where players have groggily trotted back onto the field after a clash of heads? In 2014 new rules were introduced in response to Tottenham Hotspur goalkeeper Hugo Lloris playing on after losing consciousness. However, despite taking the decision out of the management's hands and introducing an extra 'tunnel doctor' there have still been multiple controversial incidents this season (like this and this, for example). Dr. Michael Grey, a Reader in Rehabilitation Neuroscience at the University of East Anglia, believes more effective sideline tests can detect subtle changes beyond the current criteria, which involves giving players a baseline test before the start of each season. He hopes it will prevent players carrying on with concussions, or coming back before they have fully healed. He and a team of researchers have developed a VR solution that requires players complete a dual task paradigm test, while standing on a Nintendo Wii balance board. "Balance tests seem to be one of the most sensitive tests for concussion assessment. We give the brain something to do, then we change the visual environment and that puts people off balance," Dr. Grey explains. "We're looking as the extent to which people who have a concussion will be sent more off balance than people who do not." "We see it frequently when a player is evaluated," Dr. Grey says. "They clearly have a concussion, but don't realise it. The adrenaline of the match and the desire to get back out and play overrides everything else. "With a test like this we can send somebody off balance right away and the player can see 'maybe my head's not OK'." Although rustling up a Wii balance board shouldn't be too problematic, an Oculus Rift/PC combo isn't practical or affordable at most levels of the game. So Dr. Grey's team is also looking to miniaturise the system with a mobile VR headset. "The elite level players have medical staff, but kids who play in youth leagues don't have any of that," he says. "I'm very interested in having a system that's usable by coaches and parents, not just the professionals." For anyone who has used both the Rift and a headset like Google Cardboard, it's obvious the inherent challenge with this idea is maintaining the quality of the experience. "My intention is to test these [mobile] systems and make sure they work in the same way the Oculus Rift does. If you get it wrong with VR we can induce motion sickness," Grey says. "I started in this area 20 years ago testing virtual reality and it just didn't work. We didn't have the computing power. What we're testing now with the mobile solution is whether the experience will be good enough to work in this environment." So far, the Rift-based solution has won over a sceptical West Bromwich Albion's club doctor who "changed his tune significantly" according to Dr. Grey. The Football Association, which says it takes the issue "extremely seriously", is aware of the trials, but there are no talks underway to one day implement the system. Dr Grey still believes an inherent 'change of culture' is necessary within the game. "We have a lot of people who just don't believe this is an issue. When people are sent back onto the pitch it sends a message to kids that is what you need to do to play at that level. We need to get players off the pitch, let the brain recover and get out and play again. "Hopefully, this tech can help."